In the context of Canada Reads 2013, Indian Horse and The Age of Hope are the newest books on the shelf, both published in 2012. 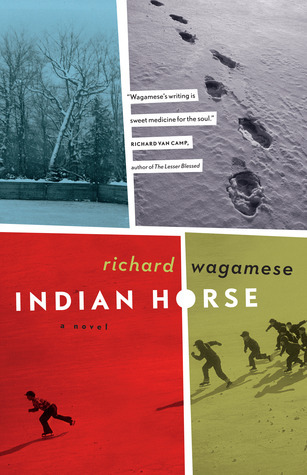 Indian Horse, the entry for British Columbia and the Yukon, is the latest work from Richard Wagamese, an award-winning newspaper columnist, author and poet who lives in Kamloops, BC. Olympic wrestler Carol Huynh will champion Indian Horse in the debates, coming up from February 11 – 14. SPOILER ALERT – “MY THOUGHTS” contains specific quotations and important plot points from the book. If you plan to read Indian Horse yourself, you may want to scroll down directly to “RATING”. I was reluctant to start this book…the tale of a residential school survivor going through rehab…I feared it would be terribly dark and depressing, and maybe a little uncomfortable. Yes, Saul describes some terrible, horrible things that are absolutely heart-wrenching: abuse, betrayal, being ripped from his grandmother’s protective arms… One shocker, near the end, made me cry. Saul clearly describes Ojibway connections to the land – physical, spiritual and emotional. His family retreats to Gods Lake in an attempt to bring healing to Saul’s brother. He aches for the land when confined to residential school and finds temporary solace in the land during his years as a drifter. It’s not until he returns to Gods Lake that he finally finds a semblance of peace, discovers a new sense of purpose and regains his ability as a seer. I know my own experience is nothing at all like Saul’s. I live in the mainstream, have enjoyed a successful career and am happily married with kids. But there are still times when I start to go a little bit nuts. And for me, the best cure is a day in the mountains, hiking up somewhere high and away from the hustle and bustle and crowds of the city, to a place where I can just sit and be. So I easily connected with Saul’s need to “be” in nature. Integrity -Saul holds strong views on how hockey should be played – skills based, with finesse (à la Wayne Gretzky), avoiding cheap shots and fighting. And so long as he stays true to this vision, he does extremely well at hockey. Unfortunately, in the face of entrenched preconceptions and racism, he eventually succumbs to the pressure to fight. In losing the integrity of his vision for hockey, Saul loses much more, turning to alcohol for a semblance of the release he once found on the ice. It’s a harsh tale of the importance of being true to yourself and your beliefs – something that every parent aspires to teach their children. Indomitable spirit -In the end, it’s Saul’s spirit that carries him through. “I stood on the edge of the cliff with my pouch and eagle feather fan and my family stood around the fire in the trees looking up at me. Soft singing, low like a prayer, came from the boats below. I took a pinch of the tobacco from the pouch and held it up to the evening star. As I did, the sky eased into purples and blues and indigos. The singing from below rose higher and the great northern lights emerged to dance beneath the unblinking eye of the moon. I cried in great heaving gasps. I let myself mourn. Allowed every ounce of sorrow and desperation, loneliness and regret to eke out of me. I cried until I couldn’t cry anymore. Then I heard my name. As a student of martial arts, I well know that indomitable spirit – inner strength of character – is one of the framing tenets of taekwondo. It’s a trait that’s essential to overcoming hardship and finding your way in the face of adversity. By the end of Indian Horse, Saul has started down a path of renewal, a path he was able to find only because of his indomitable spirit. As Saul takes to the ice for his next face-off, the end of his tale conveys a sense of hope and strength. Wagamese does a great job of character development. In addition to Saul, I particularly came to admire Saul’s grandmother and the Kelly family – all models of indomitable spirit. His portrayal of Father Leboutilier and others at St. Jerome’s residential school is masterful. The matter-of-fact depiction of the details of life-before-rehab anchor Saul’s story. This style allows Wagamese to slowly peel away the protective layers Saul carefully constructed over the years, to shine a light on some of the most troubling aspects of the damaging residential schools era relationship between First Nations and mainstream Canadian society, all without overwhelming the reader. It’s this delicate balance that gives Indian Horse broad appeal. And for many, Indian Horse will provoke a personal response. It’s my view that more than a few readers will think something along these lines… “I know I heard about the Truth and Reconciliation Commission and Harper’s apology, but I really should know more about this.” And it’s my hope that many (including myself) make the effort to follow through. Final random thought – I’m not sure why, but while reading Indian Horse I kept thinking of paintings and children’s books by Bill Brownridge. I guess they helped me imagine what it was like for Saul and the rest of the hockey team from Manitouwadge every time they hit the outdoor ice.. RECOMMENDED: Anyone interested in First Nations in the Canadian context (“Idle No More”, residential schools and long-standing preconceptions/prejudices), those inspired by stories of indomitable spirit, and – perhaps most obviously, those with a passion for hockey. RANKING: This is my third review, but I’ve finished all five books for Canada Reads 2013. Indian Horse is my pick to win it all.